The Mazda CX-5 is the most exciting car in the world’s least exciting automotive segment. What do you need to know before you buy a Mazda CX-5? Don’t worry, we’ll tell you everything right here in the Ultimate Buyer’s Guide. Mazda is having a product renaissance right now, with nearly every product in their portfolio situated as, or among, the best in their segment. That distinction carries over to the CX-5 crossover, which is the best handing and most fun to drive vehicle you can buy in this size in this price range. It helps that the CX-5 is also built on the same platform as the equally good Mazda6 and Mazda3. Did we mention you can get it with a stick? You can get it with a stick. Granted, not everyone cares about performance in this space, which is why the CX-5 isn’t always the most popular choice. There are bigger crossovers for people who want extra space and there are better AWD systems. What the Mazda bring to the table is a 2.0-liter Skyactiv engine that brings 35 MPG on the highway when paired with the six-speed, which is the best for any crossover in this class. 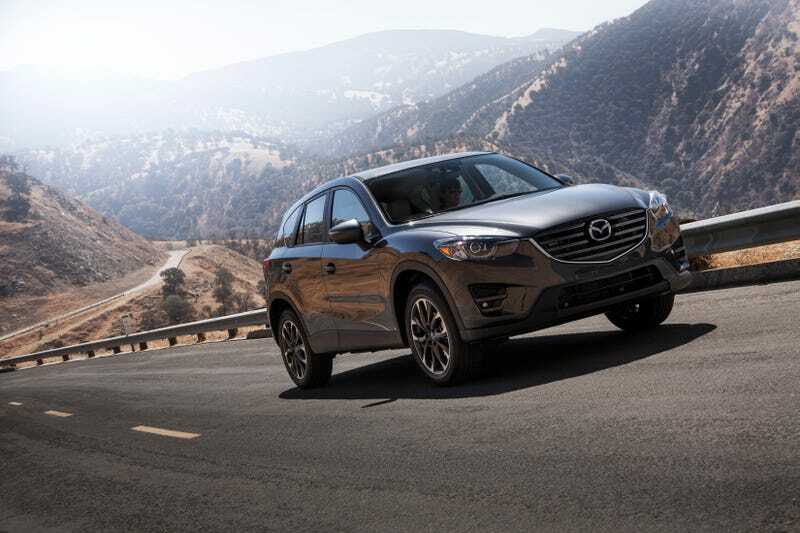 The current generation Mazda CX-5 has been out since the 2013 model year and has received some major updates since its launch including a new powertrain. For 2016, the CX-5 gets a new center console, a new electronic park brake, standard Bluetooth capability, and an available new 7-inch display. Also new for 2016, the 2.0-liter model is no longer available with an automatic transmission. Mazda offers two engines on their CX-5s. The engine that the CX-5 launched with in 2013, the 2.0-liter, is a bit down on power, only pumping out 155 horses. But the 2.5-liter engine that launched in 2014 makes quite a bit more power and torque, at 184 HP and 185 lb-ft, respectively. All 2.5-liter CX-5s are backed by 6-speed automatic transmissions, while all 2.0-liter models come with the 6-speed manual. That’s right, folks, if you want to row your own, you’ll have to make do with the smaller motor. But it’s not all bad for us manual-loving enthusiasts. Even though we’ll have to make do with a meager 155 horsepower, we’ll enjoy a whopping 35 mpg on the highway. That’s better fuel economy than many compact sedans. The more powerful 2.5-liter mill does pretty well in 2-wheel drive form, pumping out 33 mpg on the highway. Unsurprisingly, the 4WD CX-5 with the larger engine manages the lowest fuel economy numbers, but at 30 mpg highway, does quite well. All CX-5s come with a multilink rear suspension, McPherson Strut front suspension, and electric power steering. Front disks are ventilated 11.7 inch units, and the rears are solid 11.9 inch rotors. CX-5s come in three trims: Sport, Touring, and Grand Touring. Sport: Base model. Starts at $21,795. Notable standard features: 6-speed manual transmission, 2.0-liter I4 engine, cloth seats, 17 inch aluminum wheels, 225/65/R17 all-season tires, air conditioning, power windows and locks, cruise control, Bluetooth capability, tilt/telescoping steering column, 60/40 folding bench, 4-speaker audio system, front and side airbags. Notable options: Rear Camera Package: backup camera, 7 inch touchscreen display for infotainment system ($400); Automatic transmission with 2.5-liter engine ($1,400); All-wheel drive+2.5-liter engine+automatic ($2,650). Touring: Starts at $25,215. Notable standard features over sport: 2.5-liter I4 engine, 6-speed automatic transmission, 7 inch infotainment touchscreen display, 6-speaker audio system, power driver’s seat with manual lumbar support, 40/20/40 folding bench, premium cloth seats. Notable options: All-wheel drive ($1,250); Bose/Moonroof Package: Nine-speaker sound system plus moonroof ($1,130); Technology Package: navigation, LED headlights and foglights, adaptive headlights, rain-sensing wipers, collision warning ($1,625+Bose/Moonroof Package). Grand Touring: Starts at $28,220. Notable standard features over Touring: leather power heated seats with power lumbar support, rain sensing wipers, power moonroof, heated mirrors, 19 inch wheels, dual zone climate control, nicer door trim, Bose 9-speaker audio system, satellite radio. Notable options: i-ACTIVESENSE package: Radar cruise control with proximity warning, lane departure warning, and high beam control ($1,500); Grand Touring Technology package: navigation, LED headlights and foglights, adaptive headlights, collision warning ($1,505); All-wheel drive ($1,250).